For group assignments that have been created using the Blackboard Groups tool, one student will submit on behalf of all members of the group. To access the group submissions, you can either access the Grade Center of use your Needs Grading option. From Needs Grading, use the Filter lists to narrow the list of items to grade by Category, Item, User, and Date Submitted. For example, filter the list by Category and display only assignments and by User to select a specific group. The filtered items appear on the Needs Grading page. Select a column heading to sort the items. 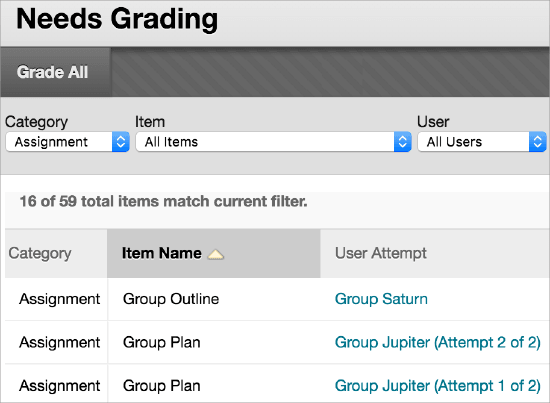 From the Grade Center, group assignments that have been submitted but not graded are indicated with the Needs Grading icon. 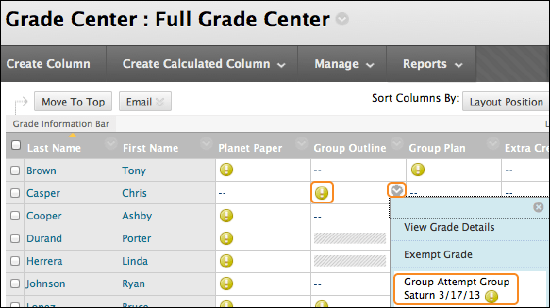 In the Grade Center, access the group assignment column's menu and select Grade Attempts. Alternatively, you can locate any group member's cell for the group assignment that contains the Needs Grading icon. Access the cell's menu and select the Group Attempt. You can grade and annotate student files directly within the browser using the New Box View. You can assign a group grade, provide feedback with an assigned rubric, and leave comments to the students in the group using the Feedback to Learner box. On the Grade Assignment page, supported file types open in the browser. Original formatting and embedded images are preserved. If a group has uploaded an unsupported file to the assignment dropbox, you will be prompted to download it.